From Mad TV to the Colbert Report to SNL, popular media has created countless parodies and satires of celebrities, politicians, and of course corporations. Especially corporations that are making millions of dollars on corrupt business. Funny as they are, these media outlets also serve as a microphone for the nation's complaints and struggles. Following that line of reasoning, our group decided to modify an ad from Monsanto to reflect the huge negative impact this insanely wealthy corporation has had on our health and the environment. Monsanto is a U.S.-based agricultural and pharmaceutical monopoly; Monsanto Company is a producer of herbicides, prescription pharmaceutical drugs, and genetically modified organisms (GMO). The global Monsanto Corporation has operated sales offices, manufacturing plants, and research facilities in more than 100 countries, and the largest share of the global GMO crops market. Its engineered crops account for 91% of the total area of GMO crops planted worldwide. Based on 2001 figures Monsanto was the second biggest seed company in the world, and the third biggest agrochemical company. Monsanto's business is currently run in two parts: Agricultural Productivity, and Seeds and Genomics. However, Monsanto also has a long and dirty history of polluting the US and others countries with some of the most toxic compounds known to humankind. From Polychlorinated biphenyls (PCB's) to Agent Orange to Roundup, there are many reasons to question the motives of this corporation that claims to be working to reduce environmental destruction and feed the world with its genetically engineered food crops. The Advertising Standards Authority (ASA) of South Africa ordered Monsanto to immediately remove a radio ad that falsified the benefits of crops containing genetically modified organisms. Monsanto affects Global Politics in a dense way. Monsanto contaminated the food you are eating today with chemicals and unlabeled GMOs. Monsanto, whether you like it or not, do in fact control much of the world's food supply. Monsanto attacks food supplies, poisons our local farms, harms our environment, and makes companies more powerful than governments. Monsanto doesn't mind how much it's affecting or harming the world. Monsanto is also intimately involved with intellectual property laws and their enforcement around the world, because they have a vested interest in other companies not making cheap knock-offs of their products. They have aggressively enforced their property rights by suing farmers around the world for having cross-contaminated seeds (nearby farmer buys Monsanto seeds, their genetic information is cross pollinated by bees into a different farmer's field, which under a strict interpretation of the law is an intellectual property rights violation). We choose this poster to creatively interpret because it is, in its original form, an advertisement for Monsanto's local development and charity work in Saint Louis, Missouri. We chose to riff this poster and its message because it's one of unity, community, and locality. Monsanto, however, drives the largest use of oil in agriculture outside of transportation with their sale of pesticides and herbicides like RoundUp (and the RoundUp Ready seeds genetically modified to resist that herbicide). Herbicide usage is very environmentally damaging, and producing the chemical and the seeds that resist it while very profitable, do not uphold the values the original poster purports to support. The modifications note the poisonous nature of pesticide, both for the environment generally, and for humans and their communities. We have also added gas masks for the people collecting the food. Those workers do not often have adequate protective gear for whatever chemicals they might be working with, in a commercial industrial agricultural context. 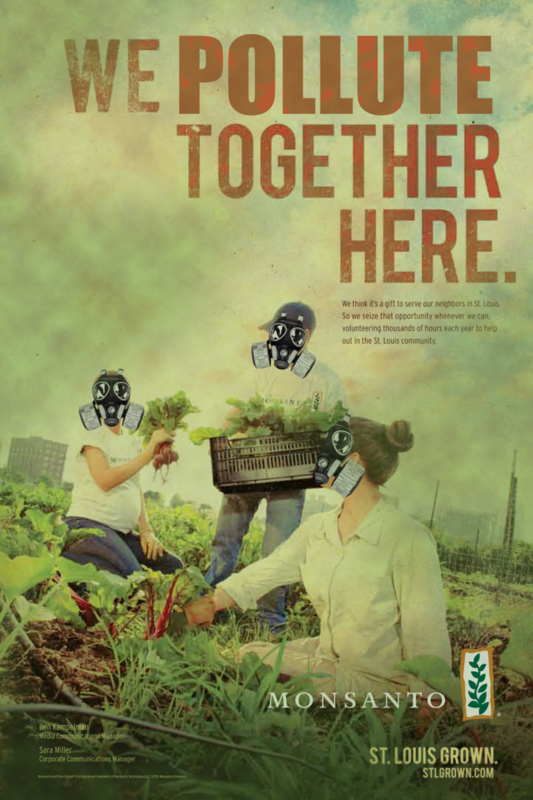 In our Monsanto spoof we wrote, "We Poison Together here". Monsanto has a recurring theme that has two words: here and we. "We Grow Ideas Here", "We Dream Here", "We Grow Ideas Here", and last but not least "We Work Together Here". We decided as a group that we don't want to change so much of the theme "We" and "Here". Monsanto uses "We" and "Here" to attract people and make them feel that their company is a collaborative thing and it is harmless and its beneficial. Monsanto's company is designed to maximize its profits, not to serve the people. Its seed business model is designed to trap farmers in a system of economic dependence. It will turn farmers completely dependent on them. They won't be able to go back to regular farming because all the other soils will be tainted. Our spoof was created to show that Monsanto does not help anyone it just poisons soil and the crop that is growing.